Do people from New Zealand have a unique nickname? What is the national symbol of New Zealand? What comes to mind when you hear the word “kiwi"? Most likely many kids will immediately think of the small green fruit with the tiny black seeds. But did you realize that some people might think of a flightless bird or even a person? It's true! Kiwi can refer to several different things. For example, it's a fruit that's sometimes called kiwifruit or even Chinese gooseberry. These small, egg-shaped fruit have brown skin and bright green flesh with small, black seeds. Kiwifruit are soft with a sweet, unique taste. They can be eaten alone or mixed with other ingredients as part of many different types of tropical recipes. Many people eat kiwifruit for their variety of health benefits. Kiwifruit are good sources of vitamin C, potassium, vitamin E, vitamin A and fiber. Their skin contains antioxidants, and their seeds provide omega-3 fatty acids. Today, kiwifruit are grown commercially in many different countries, including Italy, Chile, Greece, France and New Zealand. Speaking of New Zealand, that brings us to another type of kiwi. Did you know that people from New Zealand are often called Kiwis? The nickname started with New Zealand military units, but has become common with national sports teams and the population in general. Are New Zealanders named after kiwifruit? Nope! The people of New Zealand — and kiwifruit — actually both take their names from the other type of kiwi: the flightless bird that is native to — and the national symbol of — New Zealand. If you're WONDERing how to keep these kiwis straight, most New Zealanders capitalize Kiwi when referring to people but not when referring to kiwi birds. Likewise, more than one New Zealander would be called Kiwis, while more than one flightless bird would be called kiwi. Kiwi birds are flightless birds about the size of a chicken that are usually brown. Native to New Zealand, there are five species, several of which are endangered. Kiwi populations have been stabilized in New Zealand thanks to conservation efforts and protected reserves and national parks. Kiwi birds tend to be shy and nocturnal. In the wild, they hunt at night to avoid predators. In areas where there are no predators, such as protected reserves, kiwi can be seen during the day, too. Kiwi birds are the only birds with nostrils at the ends of their unusually-long beaks. It's no surprise that they have a very keen sense of smell. They tend to eat insects, seeds, worms, fruit and small amphibians. With their long beaks and good sense of smell, they can find food underground that other creatures miss. 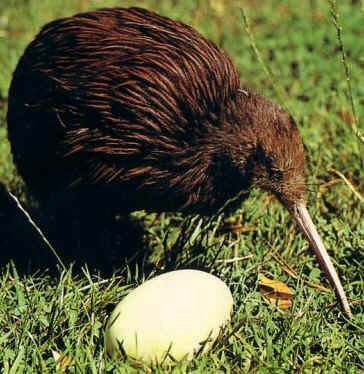 Female kiwi only lay one egg each season, but it's a big one! Kiwi eggs can weigh up to one quarter the weight of the female, making them the biggest egg relative to its size of any bird in the world! Tomorrow’s Wonder of the Day will crack you up! Do you like kiwi? And, to clarify, we're talking about the fruit, not the people or the bird! I live in New Zealand and I've seen a kiwi before! You can go to Rainbow Springs in Rotorua, North Island! Wow. Weird how kiwis are people?! I didn't know kiwi were birds and also a fruit. Why all of them the same name? Did scientists get lazy? If all scientists were lazy, Sonaliii, many of our Wonders would still be unexplained. We're lucky that scientists ask good questions and love Wondering! they are lazy! a lazy scientist is normal. what about H20? The could've written Hydrogen Hydrogen Oxygen, but they were lazy! I Love Kiwis! They are cute and fluffy!!! Oh my! It is so cute! I wish I could have one. How rare is it? Is it legal to have one? I think next time it would be about dinosaurs. That little chick is so cute!!!!!!!!!!!!!!!!!!!!!!!!!!!!!!!! You guys are awesome! I love wonderopolis, I'm going to start telling my friends about this. You guys rock. WOW that is AWESOME! I think tomorrow's wonder will be either something about jokes or an egg. This is cool I would like to see one of these birds in reality. I would like to try this fruit.